Marietta Main Street's Hometown Holidays Committee has been hard at work since 2017 planning for their newly-launched Christmas in July holiday campaign. "Our Committee is comprised of local volunteers who want Marietta to shine as bright as we can during the holiday season," shared Debbie Cline, lead coordinator of the Hometown Holidays Committee. "Our focus is to provide our downtown with new decorations that uplift a fun, festive ambiance for locals and visitors to warmly experience the Christmas spirit." With a firm set of goals came lots of meetings to generate ideas, review feedback, and chart a full plan for sprucing up the holiday season in downtown Merry-etta. Locals and tourists alike have lots of fun to look forward to in the 2018 holiday season downtown, like the Holiday Loft Tours, Merry-etta Christmas Parade, and First Friday: Moonlight Madness. DeBarr Trucking Co's float in the 2017 Merry-etta Christmas Parade. "Our holiday events generate lots of foot traffic downtown, which is perfect for all those shoppers looking to check gift item purchases off their list for loved ones," shared Cristie Thomas, Main Street Executive Director. This year, Marietta Main Street will offer a handful of new events and attractions for the community to enjoy. "We are toying with a few different ideas right now. The Committee is eyeing a Santa Claus themed bar crawl, a gingerbread competition, and a Santa House on the weekends for folks to get their picture taken with Santa right in the heart of downtown," said Thomas. Other ideas include a fun run, a Cookie & Hot Cocoa crawl for the family, and a Whoville-inspired village at the Armory. While the Hometown Holidays Committee is looking forward to introducing new events into the lineup, perhaps the most notable change will be the holiday decor. Last year was the final year for Main Street's candy canes to hang on the posts. “We are looking forward to seeing Downtown Marietta decked out in festive new décor this year, brightening up our streets during the winter and creating a cheerful destination for holiday shoppers and visitors alike,” said Heather Allender, President of the Marietta Community Foundation. 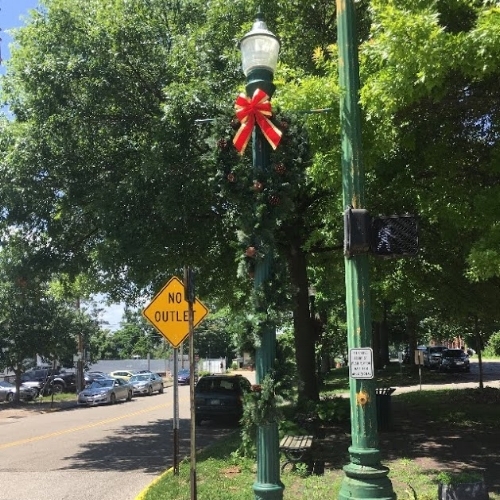 The Hometown Holidays Committee will be introducing brand new holiday decorations to as many downtown lamp posts as they can, based on the successes of this month's fundraising campaign. Specifically, the Committee hopes to raise enough money to decorate at least 100 lamp posts with lit wreaths and garlands. To decorate 100 posts, the fundraising campaign will need to generate nearly $25,000 in revenue no later than August 1st. Thankfully, support from the Marietta Community Foundation and a private donor have started the pot with $3,000 in contributions. In support of Main Street's efforts to uplift the holiday season and beautify the heart of Marietta, Peoples Bank Theatre will host a raffle in gratitude of the businesses, organizations, and individuals who adopt a lamp post with a $250 donation to this effort. The raffle will be for a $250 gift certificate to the Theatre. A sample post is on display on the corner of Front & Butler Streets downtown. "We really believe in the importance of sharing the holiday celebrations as a community. From the parade, to the tree lighting, the decorations along the brick streets, and special programs throughout downtown, it's a time of year that the spirit of Marietta shines brightest and most beautifully," shared Drew Tanner, Director of Marketing for Peoples Bank Theatre. For those interested in supporting this effort, Marietta Main Street will also be hosting a raffle to giveaway two tickets to this year's Holiday Loft Tours. Financial contributions made at any level will be included in this raffle. All donors will be published on Main Street's list of Christmas in July supporters. In addition, all donors who adopt a lamp post will have a gift tag installed on a downtown lamp post in their honor during the holiday season. Click the button below to support the Christmas in July fundraiser.